FFA of Thin Red Line. Welcome to Washington Pass, one of the best alpine rock destinations in North America. Washington Pass has something for everyone, from glacier climbs and short, easy, multi-pitch scrambles to difficult, big wall test pieces. In the Cascades, Washington Pass has some of the shortest approaches to a variety of small and large alpine routes on quality rock in a dramatic setting. Nowhere else can you walk one hour from your car and get on a Grade V.
Most routes climb high quality granite crack systems on traditional climbing gear. The rock quality is generally solid and clean with good texture. There are many edges and facehold and generally plenty of cracks. Long stretches of bolted face climbing are rare. Some routes have chimneys but you generally need only moderate (5.7-5.8) wide climbing skills. Unlike Yosemite which often has slippery polished face, the rock at WA pass is highly textured and lets you often climb imposing and exposed pitches at a moderate grade. Because this is a popular alpine rock climbing area, it is essential to be aware of dropping rocks and scree on climbs and descents. WA pass granite is featured which often makes cams feel more solid than nuts. When nuts are used, they are mostly in the medium size (we'll warn you when smaller gear is needed in the guidebook!). For many of the longer routes, a LARGE number of slings are neededit is common for pitches to wander. Because the descents often involve scrambling, a good pair of sticky rubber approach shoes is highly recommended. You will want a pair of comfortable climbing shoes for most routes or tighter shoes that come on and off very quickly. A helmet is a must for both potential loose rock and dropped gear from climbers above. Here's the rack we at SuperTopo bring when we climb around WA Pass. This is just to give you a general idea of what to bring. Check to the SuperTopo guidebook before climbing each route to see specifically what you need. A good supply of water is key, both for climbing days and for camping. If the route does not have a lot of chimneys, we carry a hydration pack or put a bladder in our climbing pack. Bring water purification tablets if drinking from a stream. Good approach shoes are strongly recommended for the longer approaches. Sunscreen and sun hats for warmer periods, and warm gear and rain gear for the frequent thunderstorms. Don't forget the headlamp on multi-pitch routes, many people get hung up behind slow parties or take longer on the descent than they expect. A headlamp is essential to get down if it gets dark. A small knife is handy to remove old webbing at rappels. For three weeks, usually in July, the mosquitoes are FIERCE so bring plenty of insect repellent. Trekking poles can save your knees on the big approaches (get tri fold collapsibble poles so they will fit in a pack). Washington Pass's climbing history dates back to the 1930s with a lot of routes going up in the 1960s and 1970s. The ASCA and local climbing guides have been working hard to replace old bolts, especially at rappel stations. That said, many old ones still remain. Inspect the anchor you're rappelling off, and if in doubt, back it up. Just because the last person rapped off it without any problem doesn't mean you should blindly use it. There are also many old pitons and slung blocks for anchors. Inspect the webbing, wiggle the pitons or kick the block before blindly trusting your life to it. Leaving an extra sling is well worth not becoming a paraplegic or worse. From the west, there are two options with no more than five minutes difference in duration. Option 1: If driving I-5 northbound, take exit 230 toward Burlington, Sedro-Woolley and turn east onto Washington State Highway 20. Follow Highway 20 east for 102 miles to Washington Pass at milepost 162. Marblemount, at milepost 106, is the last place to buy food and gas until Mazama, 74 miles on and 18 miles further east of Washington Pass. Option 2: From I-5 take exit 208 onto state route 530 toward Arlington. Take a right onto Washington State Highway 20 and drive 56 miles to Washington Pass. If driving I-5 southbound, take exit 232 with signs for Cook Road. Follow Cook Road for four and a half miles until it runs into Highway 20. Take a left onto Highway 20 in the town of Sedro-Woolley and drive 98 miles to Washington Pass near milepost 162. Marblemount at milepost 106 is the last place to buy food and gas until Mazama, 74 miles on and 18 miles further east of Washington Pass. From the east, follow Washington State Highway 20 to Washington Pass. Washington Pass is at Milepost 162, 17 miles west of Mazama and 30 miles west of Winthrop. The closest gas to Washington Pass is at the Country Store in Mazama, 18 miles to the east. In Winthrop, there are a few gas stations. Their gas can be a few cents cheaper per gallon than in Mazama but they are another 14 miles to the east. If traveling from the west, there is NO GAS for the 70 miles from Marblemount to Mazama. As a result, the gas in Marblemount is expensive, so filling up in one of the towns before Marblemount, like Sedro-Woolley, saves you some money. Bellingham and Wenatchee offer slightly closer airports to Washington Pass, saving you 30-40 minutes of driving, but airfare is at least $50-100 more. Instead, consider flying into Sea-Tac airport in Seattle. Sea-Tac also offers more affordable car rentals with more vehicle options. If you arrive by air, you need to rent a car. There is no bus transportation to or from Washington Pass. Highway 20 typically opens in late April or early May and closes sometime in middle to late November or early December. The most popular time for ice and mixed routes is the first two to three weeks after the highway opens and the final two to three weeks before it closes. For most of the rock climbing routes, the best time of year is midsummer—late June through early September. For the warmer, south facing routes, the slightly cooler temps of June and then September into early October can nice. This is a big transition time for the pass as the snow begins to rapidly melt away. By late May many of the south and west-facing routes start to dry out. Boots are typically worn on the approach. However, snowshoes or skis are no longer required to reach the base of the routes. Crampons or an ice axe can be helpful in the shady gullies when the snow is firm. During this time the weather is getting much better. More than half the days are sunny and by the end of June you can comfortably climb in the shade. This is the best time of the year to rock climb in the Washington Pass region. Starting in late June or early July, depending on the snow year, you can make many of the approaches in hiking shoes. The routes are usually dry, and by mid-July, you can comfortably climb routes in the shade. On warmer days, you might even seek it out. Most days are sunny, and if there are storms, they are usually short lived. North facing routes get a little colder. Ice and snow can linger on north faces for a few days after a storm. Climbing in the shade generally requires climbing in a puffy. But climbing in the sun is still likely to be pretty nice. The weather is still decent, with more than half the days nice enough to climb. Storms can move in for one to three days, often dropping snow on higher elevations, but this quickly melts and dries on sunnier aspects. The ice and mixed routes start to come back into shape; snow lingers on the approaches and on ledges even in the sun. 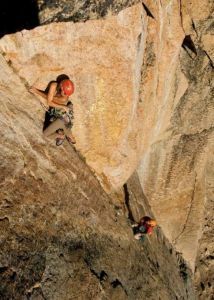 Rock climbing, even in the sun, is a little chilly and climbing in the shade is often uncomfortable. Boots might be needed for more of the approaches as the storms continue to roll through, and consider bringing an ice axe and crampons. Nearly all routes have some lingering snow and wet sections. The highway is closed and there is generally a lot of snow after mid-December. Climbing near Washington Pass during these months is pretty uncommon and several routes in this book have never seen a winter ascent. During these months, many skiers make the 16-mile journey along the snow covered road on a snowmobile to go touring. There is a Heli ski operation – North Cascade Heli Ski – that flies in this area during the winter months. The weather at Washington Pass is better than on most of the peaks west of the crest. It is not uncommon to have full-on rain all the way to Rainy Pass and then dramatic improvement in the short distance to Washington Pass where you get mostly sunny skies. There can be a few afternoon thunderstorms in Washington Pass but with nowhere near the consistency as in the Tetons or Colorado Rockies. The road is closed during the winter. Usually the road closes in November or December and opens as early as March and as late as May. See current road conditions. Lightning tends to hit high points, trees, and water, but will hit low points next to high rocks, flat areas near tall trees, and dry land in areas with lakes. Know CPR. Unlike most other injuries that stop the heart, electrical shock victims can suddenly awaken after extended CPR. CPR should be continued indefinitely. There are three campgrounds within 18 miles of Washington Pass. Lone Fir Campgroundis the closest campground to Washington Pass. It is seven miles east of Washington Pass and 11 miles west of Mazama at 3,600 feet, Lone Fir has 26 sites, 22 for tent, car or RV and four for tent only. Cost is $12 per night. Lone Fir Camp ground is laid out in a loop and has a nice mix of sites, from denser trees in new growth forest to more wide open sites with camping options in full sunshine. Unlike many of the other campgrounds in the area, the maximum stay is five days. Also because of Lone Fir's higher elevation, it is sometimes noticeably cooler than Klipchuck or Early Winters campgrounds. Klipchuck Campground is 19 miles west of Winthrop at 2,900 feet and has 44 sites. The cost is $12 per night with $5 per additional vehicle, and two vehicles maximum per site. Klipchuck is one mile off Highway 20 on NF 300, consequently it doesn't have much highway noise. There are some group sites. Abundant new growth gives Klipchuck a little more privacy than most in the area. Early Winters Campground is located on both the north and the south side of the highway, 16 miles east of Washington Pass and two miles west of Mazama, just off Highway 20 at 2,200 feet. The cost is $8 per night, and there are 12 sites, six on each side of the highway. While its smaller size is appealing, this campground is right next to the road and suffers from highway noise. Sleep in your car or in a tent. There is one bathroom on each side of the road. Up Lost River Road there is Gate Creek campground, Ballard campground, Rivers Bend campground and Rattle Snake campground. 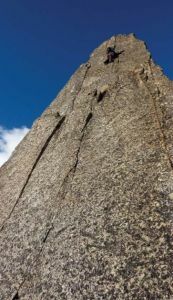 Climbers generally don't camp at these locations because they are just too far away, adding ten to 30 minutes to the drive up to Washington Pass. The Mazama Country Inn offers 18 guest rooms, each with one or two beds and private bathrooms. Prices range from $95-$160 during the spring and summer months. Rooms with dinning and breakfast options are available. 15 Country Road Mazama, WA 98833. The Mazama Country Ranch offers accommodations for larger group. Their main room sleeps 13 and their smaller Long Horn and Wing rooms sleep two to four. Prices range from $115-$365 during the summer months. There is no permit or fee to camp in any of the backcountry locations described in this book. Help maintain this low hassle situation by strictly adhering to Leave No Trace: Follow established trails, make your campsite as low-impact as possible, and dispose of human waste properly. Food is available at the Mazama Store in Mazama, 18 miles east of Washington pass. While it's a little expensive, the offerings are high quality and often made in the store that morning or grown in the Methow Valley. The closest full-on grocery store is another 14 miles east of Mazama in the town of Winthrop. Red Apple grocery store is on the east side of town right off Highway 20. The town of Winthrop also offers a variety of restaurants and bars. If coming from the west on Highway 20, consider stocking up at the Haggen grocery store in Burlington right off the 230 exit or the Food Pavilion in Sedro-Woolley before you get to Washington Pass. The closest gear shop to Washington Pass is the Goat's Beard, 18 miles east of the pass in the small town of Mazama. While small, the Goat's Beard has a pretty solid selection of climbing equipment including a variety of ropes, rock shoes, ice axes, helmets, chalk, tents, and most other things you might need. The next closest climbing shop to Washington Pass is Winthrop Mountain Sports in the town of Winthrop right off Highway 20, 32 miles east of Washington Pass. While they don't have as much climbing specific gear they have more general outdoor gear available ranging from hiking books to Nordic skis. Seattle has the most impressive selection of climbing and outdoor shops of any metropolitan area in the country. If you are going to Washington Pass via Seattle, you have more than a dozen shops to choose from. Second Ascent offers new and used gear with tons of closeouts and great selection. Feathered Friends is most famous for their selection of high quality down sleeping bags and parkas, but they also have an impressive array of higher end technical gear. The Seattle flagship REI is huge—the size of a two-story Costco—and filled with more outdoor products than you could imagine. Other outdoor shops in Seattle include Pro Mountain Sports, Outdoor Research factory store, The North Face store, The Mountain Hardwear store, and the Patagonia store. If you are travelling up the east side of the Cascades on Highway 97, the Leavenworth Mountain Sports in Leavenworth has an excellent selection of shoes, harnesses, mountain boots and other climbing equipment. I work as a mountain guide and strongly believe that whether you are a novice or an expert climber, going out with a guide can be an enriching way to experience an area. For a beginner or intermediate climber, a guide can be a great way to literally learn the ropes, and there are few people who have nothing to learn from a guide. Hiring a guide can also allow you to get the most out of a short trip. From choosing the objective that's right for the conditions and your abilities, to helping you succeed on a challenging route, one you may have only dreamt of doing, a guide can add great value to your experiences. When hiring a guide, consider the following questions. Who is your guide? Has he or she had training from the AMGA? Is he or she certified? Does he or she have experience in the area? Hiring a guide is all about your trip and you having a good experience. There are three guide services permitted to guide in the Washington Pass area. Goats - North Cascade mountain goats, also known as Mazamas, are usually found at higher elevations. They are sure-footed climbers, often resting on rocky cliffs too precarious for predators. The goats around Washington Pass are afraid of people and generally mind their own business. They can be slightly more aggressive early in the summer when their offspring are young. 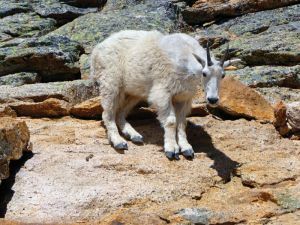 There have been rare occurrences in Washington State of a mountain goat killing a person. The goats are typically after salt and have been know to eat backpack shoulder straps, pole leashes or anything else sweaty and salty. Keep in mind there is salt in urine. Do your best to go around a goat, even if it means going off trail. Pikas - These are small mountain mice that live high in the western mountains of the United States and like to make their homes in rocky slopes. They are famous for chewing holes in your pack, tent or jacket pocket to get at food. Leaving your food in the middle of your tent (far from the walls) covered by a sleeping bag can be a good deterrent for these small creatures. There is no cell phone reception from any carrier in the Washington Pass region. In Mazama, 18 miles east of Washington Pass, there is some AT&T coverage. A few Verizon customers can pick up one to two bars near the Mazama store. Once you drive 4-6 miles east of Mazama, you will find stronger and more reliable signals. When it's raining or snowing at Washington Pass it can often be sunny, or at least climbable, just 16 miles to the east down in the crags near Mazama. 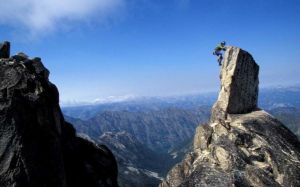 The Mazama area, with several hundred sport climbs to choose from, is a worthwhile sport climbing destination on its own. One of the more famous features in the area is the Goat Wall, which hosts a half dozen 5-14 pitch routes that are over 1,000 feet tall. 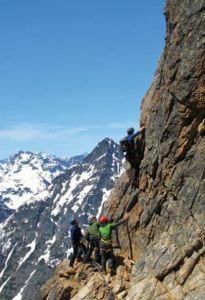 Popular crags include the Fun Rock, Canine Crag, the Rhino Zone and Prospector crags. A good book for the area is Mazama Rock by Bryan Burdo, often available at the Mazama store or from North Cascade Mountain Guides. If sport climbing in Mazama isn't what you're looking for, there is a swimming hole across from the Prime Rib parking area below the Goat Wall. The Mazama store has great coffee along with all kinds of tasty treats and is a nice place to hang out for the afternoon. Drive to Harts Pass, the highest road in the state and the only place you can drive above tree line, for spectacular views of the Cascades from the east. The western theme town of Winthrop has many shops, stores, and restaurants to cruise through. Food is available at the Mazama store in Mazama, 18 miles east of Washington pass. While it's a little expensive, the offerings are high quality and often made in the store that morning or grown in the Methow Valley.